I’ve enjoyed coloring vikings before…this guy? Oh yeah baby! He’s fun. Though I’m not certain of the setup of his outfit…anyone know if that’s a big cuff on his hand holding the ax? lol! Watch the video below or click HERE to see it in HD on YouTube. 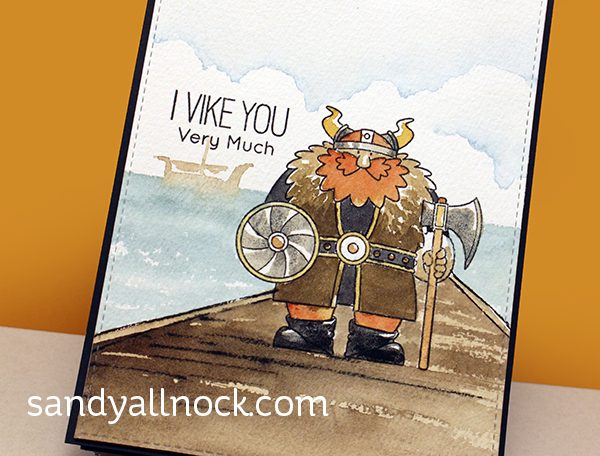 For being a tough looking Viking dude – he’s awfully cute. And fun to color! Absolutely awesome! I have 25 of these vikings ready to colour; he’s perfect for my nephew’s kindergarten class! Now…if only my copic colouring would improve! Oh well…he’s a cutie no matter what! Thank you for the fabulous video…love the ‘delight in your voice’ as you share your skills, talents and passion! Love the scene you gave this Viking—great details. Sandy, I love, love, love your art videos. You have a wonderful imagination and the gift of bringing to life. Seems like everything you touch turns out beautiful! Keep them coming. They make my day! Awesome. Love him and the scene. You can never have too many Vikings! Your scene is spot on. Fabulous card! Love your card and how you teach us to make scene. Great work. Have a nice weekend. 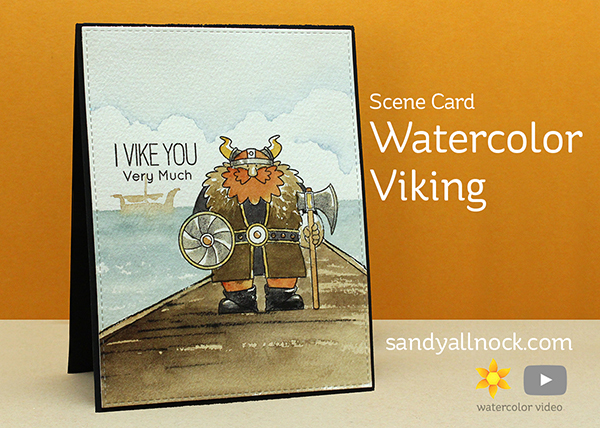 Love the viking card! I so want to try this! This IS fun and fantastic! Well done, TFS! Isn’t he awesome!!! I have only colored him once so far!!! There will be more!